Equipado con todo lo que necesitas. Ropa de cama, vajilla, caja de seguridad, incluida. 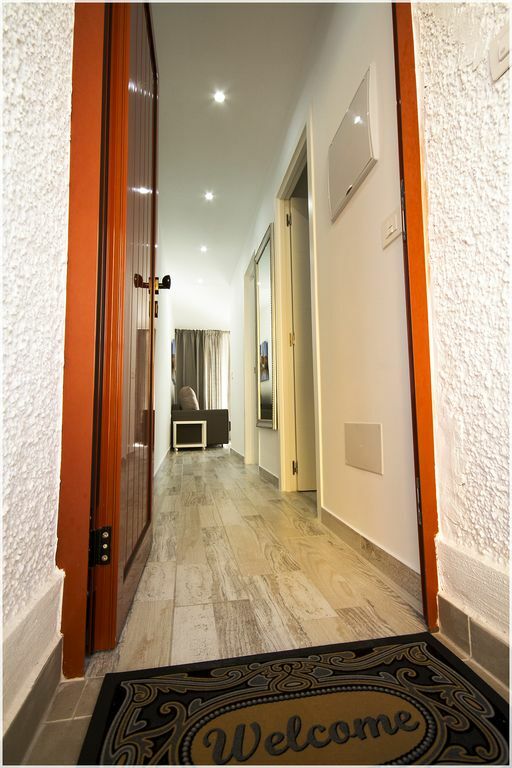 El apartamento ha sido completamente renovado, hemos diseñado y equipado para nosotros, el mobiliario es moderno, funcional y esencial. Esperamos que te guste 3 camas están disponibles. Un dormitorio con cama de matrimonio y un cómodo sofá / cama que se abre mide 140x190 cm. Cocina equipada, con microondas y nevera. Gran ducha, bidet y lavadora. TV con canales italianos e internacionales. Wi-Fi incluido en el precio e ilimitado. Balcón con vistas al mar, piscina reservada para huéspedes del complejo. Nuevo baño con ducha grande, bidet, campana extractora y lavadora. Alquiler de autos, taxis, bares, restaurantes y supermercados en la casa. no hay canales en inglés, hay canales en inglés, por ejemplo BBC world, sin aire acondicionado. This was our first time in this apartment and we will definitely be back. The apartment itself was immaculate and was fully stocked with everything you could possibly want or need. The washing machine was an added bonus and the good weather ensured everything got dry. They even supplied pegs and there was also a hoover!!!!!! (something not usually found in an apartment). The location was perfect and central to everywhere we wanted to go. Any easy stroll down to the beachfront and not far from the San Euginio shopping centre. A supermarket was conveniently at the back door which stocked everything you could possibly want and prices were reasonable. The swimming pool area was huge and kept spotlessly clean and to be honest was never very busy. Plenty of sunbeds to go round. Loads of places nearby to eat. The cosy cafe across the road did great Scottish breakfasts and we had our dinner there one night which was equally as good. A few more good restaurants nearby were the Royal Grill at the bottom of our apartment, The Embassy, Gran Maison,Marfils and Victoria's to name but a few. Also the Calypso bar just up from the apartment was a good place to go for a drink. The owners Shaun and Becky couldn't have been nicer and their prices were second to none. A mention to Stefania who was there to let us in and show us round and who also came to our rescue when I managed to lock ourselves out of the apartment. A quick phonecall to her and she arrived shortly after to let us back in much to my relief. If I had anything negative to say about this apartment it would be the outside chairs which were like big solid plastic deckchairs. No arms on them so I have to say they weren't the most comfortable to sit on while enjoying the view and reading our kindles. I also thought the water pressure in the shower was a wee bit poor but I have to say we had constant hot water so it was bearable. All in all I would recommend this property to anyone. This re-modeled apartment suited our needs just fine. The kitchen was well-equipped for breakfasts and those evenings when we cooked on our own. The location was great for walking to beaches, shopping and restaurants. The only drawback...a noisy generator in the yard below. well, I'm glad you enjoyed it. unfortunately you found the week where there were jobs that needed the generator. the next time surely in the generator will not be there. See you later. Mary and Gerry, I hope this review will be useful for future guests. Bellissimo appartamento vista mare,molto pulito e curato nei minimi particolari posto in uno stabile dotato dei migliori servizi anche per i soggetti con difficoltà motorie.Nelle immediate vicinanze ottimi bar,ristoranti,supermercati etc. Sicuramente una esperienza da ripetere e da consigliare. Grazie mille. Arrivederci a presto. Amiamo molto Tenerife, in particolare ci piace andare in questa zona. Tutto raggiungibile a piedi. Ristoranti, lungomare, locali, supermercato, parchi. Il proprietario lo avevamo già conosciuto, siamo stati anche in un altro appartamento a fine anno. Anche questa volta ci siamo trovati molto bene. Pulizia, arredamento, completo di tutto. Ideale per una vacanza. Lo consigliamo. Ottima qualità. Voi ormai siete clienti affezionati. Grazie. A presto. Le aspettative sono state rispettate. L'appartamento offre tutte le comodità ed è in posizione ottimale. Taxi, alquiler de coches, bicicletas y ciclomotores. Venta de excursiones, bares, restaurantes, perfumes, tiendas, farmacia, hospital, paseo marítimo, playas, clubes. Todo a una corta distancia a pie. Verranno chieste le foto dei documenti di identità delle persone adulte che abiteranno nella casa. Orari di arrivo e di partenza.